For stock investors, this was just what the doctor ordered. On January 15, Reserve Bank of India (RBI) Governor Raghuram Rajan reduced the repo rate by 25 basis points, or bps, to 7.75%. The cut, a full two weeks before a scheduled money policy review, fired up stocks. The BSE Sensex rose 729 points, or 2.67%, that day. BSE Realty and Bankex, too, were on fire, and rose 8% and 3.29%, respectively. These two sectors gain directly from lower interest rates. This is the first rate cut since Rajan was appointed RBI governor in August 2013. Repo rate, or the repurchase rate, is the rate at which the RBI lends to banks. Falling inflation means the RBI will carry out more rate cuts to spur economic activity, which has been slowing at a worrying pace for the last couple of quarters. Yes Bank expects a cut of 175 bps this financial year while Morgan Stanley expects a 125 bps cut. That is why this may be the right time to buy shares of sectors that gain directly from falling interest rates - banks, auto and real estate. This is good news for other sectors also. The reason is that when interest rates fall, stock markets rise. For instance, the RBI cut the repo rate by 300 bps (from 9% to 6%) between April 2001 and March 2004, and the Sensex rose 63% during the period. Similarly, between July 2008 and April 2009, when stock markets were battling the global financial crisis, the RBI cut the repo rate by 425 bps. The Sensex, as a result, recovered from the all-time low of 8,160 that it had touched in March 2009. When the RBI increased the repo rate from 8% to 9% between 12 June 2008 and 30 July 2008, the Sensex fell 6%. Interest rates reflect the state of the economy. If the RBI wants to reduce inflation, it makes loans expensive by increasing interest rates. And, it cuts rates when it wants to encourage borrowing and induce growth. "The RBI's responsibility is to balance growth and inflation, which it does by tweaking interest rates," says Samar Vijay, director, InvestCare. Falling interest rates boost corporate profitability by ensuring companies gets funds at lower rates. The reverse happened in 2013-14, when due to high inflation and interest rates and, hence, high raw material/wage costs, corporate operating profit margins fell to 16.1% from 20.2% in 2007-08. "Fall in interest rates improves corporate profitability by reducing interest payments and increasing revenue of sectors (such as automobile and real estate) where demand is sensitive to interest rates. Moreover, bond yields and market valuation have an inverse relationship," says Siddhartha Khemka, head of research, equity, Centrum Wealth Management. Falling rates increase demand for older bonds whose coupon rates are higher (as they were set in the earlier higher rate market). So, banks and mutual funds report a rise in value of bond holdings when interest rates fall. Retail inflation (5% in December 2014) is not only below the RBI's January 2015 target of 8% but is also lower than the January 2016 target of 6%. Jayant Manglik, president, retail distribution, Religare Securities, says, "The central bank expects retail inflation to remain below 6% till January 2016, which suggests the start of a rate cut cycle." Rana Kapoor, managing director and chief executive officer, Yes Bank, says, "The central bank will have an opportunity to cut the repo rate by another 175 bps during 2015-16, that is, 2% overall." "If interest rates fall, industries will be able to access credit at an affordable rate, which in turn can fuel India's economy," says Ambarish Datta, MD & CEO, BSE Institute Ltd Experts say it may take a while for consumers to start spending and companies to start investing as they would first like to be assured that low inflation is here to stay. Sunil K Sinha, director, principal economist, India Ratings and Research, says, "Although slowdown in investments cannot be attributed to just hardening of interest rates, it is one of the factors impacting investment activity." "The rate cut will provide the right signal to companies to invest and consumers to spend, a perfect recipe for accelerating growth," he says. Piyush Jain, equity research analyst, Morningstar India, says, "Whenever the interest rate cycle goes down, it usually implies that the economy is in the last phase of slowdown or early phase of recovery." 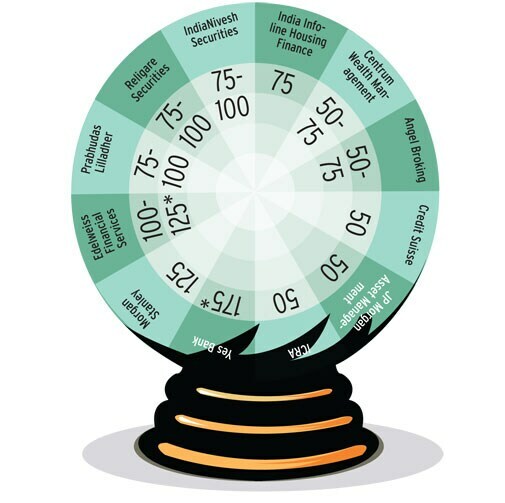 A rate cut will give a big boost to banks, which have just now started to bring their spiralling non-performing assets, or NPAs, under control. They will benefit from lower cost of funds, rise in demand for loans, gains in the bond portfolio and reduction in NPAs due to pick-up in economic growth. The banking index has risen 70% since 1 January 2014 (till February 16). Khemka of Centrum says, "A further rate cut will spur loan growth. Also, lower interest rates will cushion net interest margins and reduce NPAs." According to RBI data, net NPAs of banks were Rs 1,42,657 crore at the end of March 2014, as against Rs 98,710 crore a year ago. As on March 2014, net NPAs to net advances of Punjab National Bank, State Bank of India and Bank of India were 2.85%, 2.57% and 2%, respectively. The figures for private sector banks ICICI Bank, Axis Bank and HDFC Bank were just 0.97%, 0.44% and 0.27%, respectively. Clyton Richard Fernandes, analyst, Emkay Global Financial Services, says, "PSU banks' NPAs are high due to economic slowdown in the past three-four years." Ajay Bodke, head, investment strategy and advisory, Prabhudas Lilladher, says, "As the investment cycle picks up, corporate-focused banks like ICICI Bank will gain from higher credit off-take and upgrade in non-performing or restructured assets. Public sector banks will gain mostly due to sharp rise in profits on investment books (many hold more government securities than mandated). Improvement in the economy will also lead to a sharp drop in NPAs, freeing up capital which can be used for growth. Many public sector banks trading at or below book values can see upgrades." The stock has risen 117.57% since 1 January 2014. It was at Rs 814.90 on February 16. In spite of this, its valuation was a reasonable 17.98 times trailing 12 months earnings as against the industry price-to-equity, or P/E, ratio of 21.75. Interest income has risen more than 2.5 times in the past five years (from Rs 15,603 in 2009-10 to Rs 30,736 crore in 2013-14). Net profit rose 2.5 times to Rs 6,309 crore during the period. Jayant Manglik of Religare Securities is upbeat on the stock. "Given strong earnings growth, low impaired assets and reasonable valuations, Yes Bank should continue to give good returns." The stock underperformed other bank stocks in 2014. It rose 43%. In contrast, Yes Bank, Axis Bank, IndusInd Bank and State Bank of India rose 106%, 94%, 89% and 77%, respectively. "HDFC Bank underperformed due to FIIs' inability to buy shares as their holding hit the cap," says Bodke of Prabhudas Lilladher. 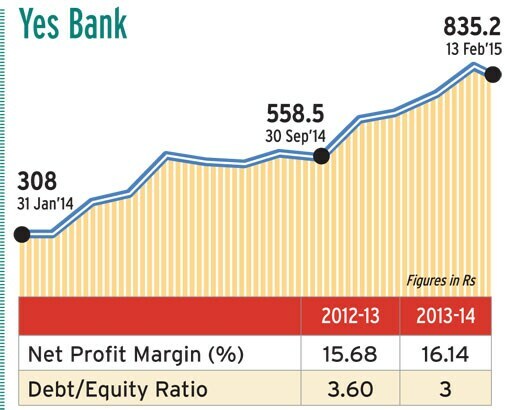 The bank has been maintaining net interest margins at over 4% since 2005-06. As on March 2014, net interest margins and net NPAs to net advances were 4.40% and 0.27%, respectively. Bodke says, "It is the best managed bank in the country with net interest margins and return on assets that are among the highest in the industry. It has shown consistent 20-25% growth with negligible NPAs. Narrowing of premium over other banks (price to adjusted book value) will drive investor interest. It is a retail-focused bank and so will gain from increase in consumption when interest rates fall." On February 16, it was trading at Rs 1,067.10, a P/E ratio of 27.44, as against the industry average of 21.75. The bank continued to open new branches even in the downturn. This has not only helped it maintain its low-cost deposit (current account-savings account) base at a healthy 43% but also improved the mix of profitable retail loans (from 20% to 38% of total loan book). Consolidated operating profit has been growing at 32% a year on an average for the past eight years. The stock has doubled since the start of the financial year and was at Rs 571 on February 16. The Sensex rose 30% during the period. Vaibhav Agrawal, vice president, head of research, Angel Broking, says, "The bank raised substantial equity last year, taking its Tier-I capital to 12.4% (as against 7-9% for most public sector banks). This positions it for growth and market share gains as economic growth revives and inflation and interest rates head lower. 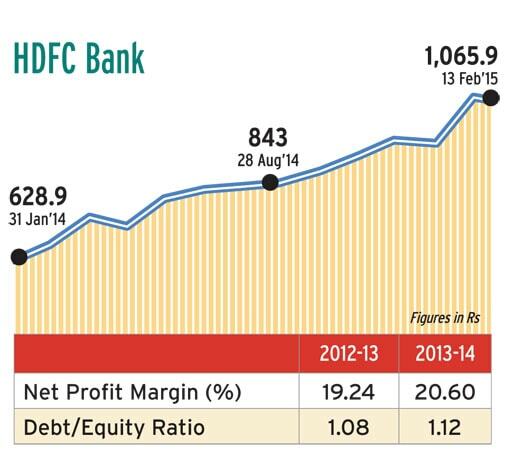 There is scope for gains considering that the bank trades at a discount of over 30% to HDFC Bank. We believe the stock can touch Rs 675 in the next 24 months." The sector will be one of the biggest beneficiaries of rate cuts as most vehicle purchases are financed by banks. Daljeet S Kohli, head of research, IndiaNivesh Securities, says, "Reduction in cash outgo of commercial vehicle (CV) owners can make business profitable despite subdued freight rates." The BSE Auto index rose 63% in the one year to February 16. This can be attributed to expectation of further rate cuts, falling fuel prices, recovery in India's economy leading to feeling of job security among potential buyers and falling inflation. During the period, Eicher Motors rose 228.68% to Rs 16,109. It was followed by Bharat Forge (225% to Rs 1,175), Bosch (186% to Rs 25,582), Maruti Suzuki India (115% to Rs 3,574) and Motherson Sumi Systems (108% to Rs 462.60). Vinay Khattar, associate director and head of research, Edelweiss Financial Services, says, "As more than 80% cars and CVs are bought on loan, rate cuts will have a positive impact on sales. This, coupled with good investment climate, will encourage gross capital formation (investments), leading to job generation and further sales," he says. For financial year ended March 2014, gross sales and operating profit of auto and auto ancillary companies rose 25% and 13%, respectively. 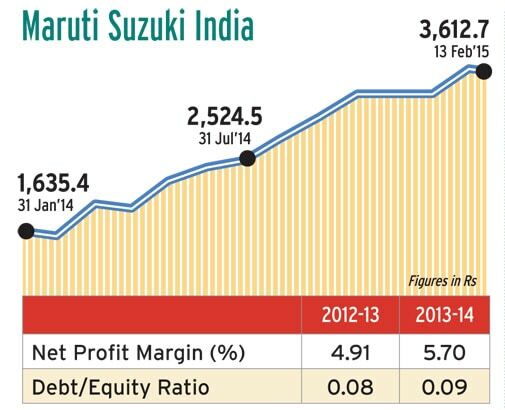 "We expect faster revenue growth in the second half of 2014-15 due to low base. Improved sentiment and fewer discounts should improve margins and profits in 2015-16." India's largest passenger vehicle maker has 15 models with over 200 variants. 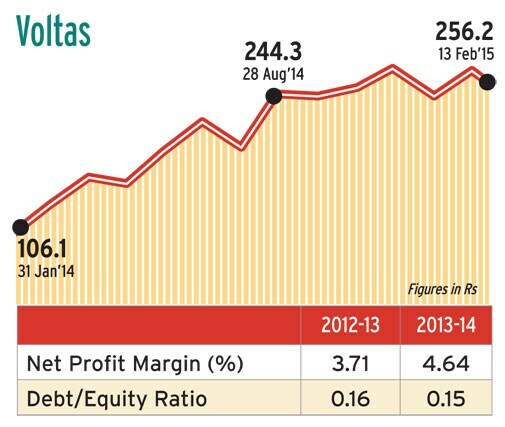 For 2013-14, its consolidated net profit was Rs 2,831 crore, 15.6% more than Rs 2,448 crore in the previous financial year. The stock rose 85% in 2014-15 (till February 16). Bodke of Prabhudas Lilladher says, "Maruti will be the biggest beneficiary of upturn in volume growth in the car sector when interest rates fall. It is likely to be an outperformer with its huge market share and distribution network." The company is market leader in auto air conditioners with 40% market share. It is a joint venture between Shri Group (40%), Suzuki Motor Corporation, Japan (13%) and Denso Corporation (13%). It provides air conditioning for passenger vehicles, utility vehicles, buses and light commercial vehicles. It recently expanded into transport refrigeration and air-conditioned railway coaches. The stock rose 148% to Rs 66.15 this financial year till February 16. Subros registered a revenue of Rs 1,321 crore in year ended March 2014, down 7.9% from Rs 1,435 crore in the year-ago period. Net profit fell 1.5% to Rs 20.26 crore. Agrawal of Angel Broking is positive on Subros. "Earnings are estimated to grow at a healthy rate of 29% a year over 2013-14 to 2016-17 on the back of improved passenger vehicle demand and margin improvement due to increased in-house manufacturing, capacity utilisation and operating leverage." A cut in interest rates will reduce borrowing costs of both developers and buyers. The sector has been going through a difficult phase for the last few years due to liquidity crunch and rising interest rates. Monu Ratra, chief executive officer, India Infoline Housing Finance, says, "High interest rates are one of the major reasons for falling residential sales." Despite the rise in equity markets, the sector failed to attract investors. The S&P BSE Realty index fell 9.5% between June 2 last year and February 16 this year. The reasons were high prices and interest rates. Unitech, Anant Raj, DLF, Indiabulls Real Estate and Omaxe fell 36%, 30%, 26%, 13% and 7%, respectively, during the period. In contrast, National Building Construction Corporation, Phoenix Mills and Prestige Estate rose 142%, 43% and 24%, respectively. Ratra says, "The mid-January rate cut is likely to inject new life into the sector. The economy is yet to pick up. Further rate cuts will help the sector. As home loan rates get more attractive, developers are likely to come up with more offerings in affordable and mid-housing segments, which will increase sales." 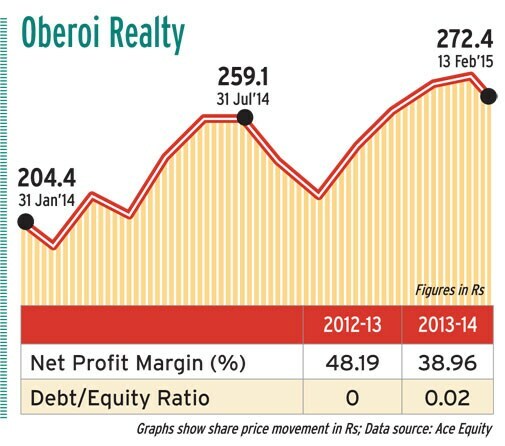 Net profit of real estate companies fell 4% on an average in 2013-14. Debt, though, rose 6%. "We expect things to improve from 2014-15. If some positive steps are announced in the Budget, the sector may revive. 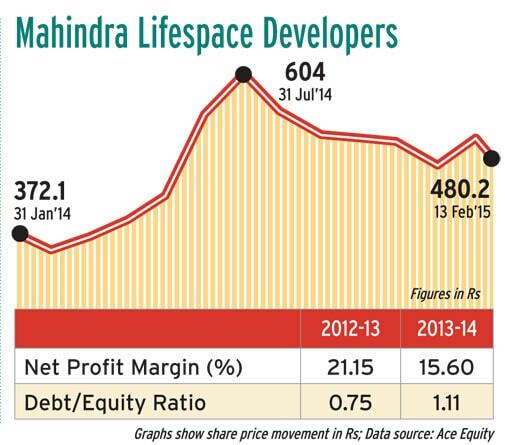 Housing finance companies' revenues are likely to grow 30% in 2014-15 and faster than that in 2015-16. However, for real estate companies, significant revenue growth will come with a lag. If the interest rate downtrend continues, we may see revenues growing at 15-20% a year from the second half of 2015-16," says Ratra. The company is present in residential, office, retail, hospitality and social infrastructure segments. 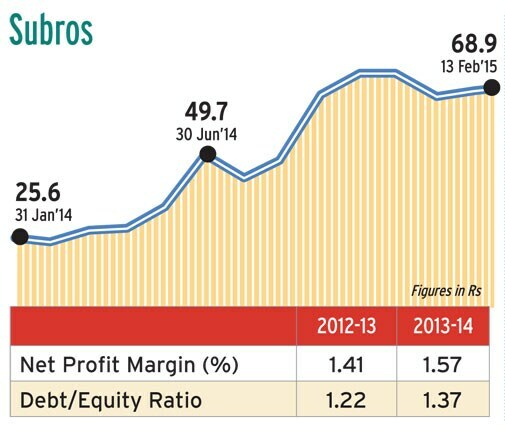 Its debt-to-equity ratio was near zero (0.02) on March 2014. Gross sales fell 23.78% to Rs 798.45 crore in financial year ended March 2014. Net profit plunged 38.38% from Rs 504.79 crore to Rs 311.06 crore. The stock has risen 22% this financial year. It was at Rs 265 on February 16 as against Rs 217.35 on April 1 last year. Manglik of Religare Securities says, "New launches and commercial leases will improve prospects. The company plans to build many projects, mainly in Mumbai's suburbs." The company operates in Jamshedpur, Bhiwadi, Jaipur, Jodhpur and Lucknow areas. It has successfully completed housing projects Ashiana Villas and Ashiana Rangoli in Bhiwadi, Residency Greens and Ashiana Suncity in Jamshedpur and Plaza and Shantiniketan in Patna. It is also developing commercial real estate with projects such as Ashiana Village Mall and Ashiana Gymkhana Club in Bhiwadi. Sales grew 33.3% a year to 2.2 million square feet between 2009-10 and 2013-14. Pre-tax operating cash flow grew 33% to Rs 125.9 crore between 2010-11 and 2013-14. 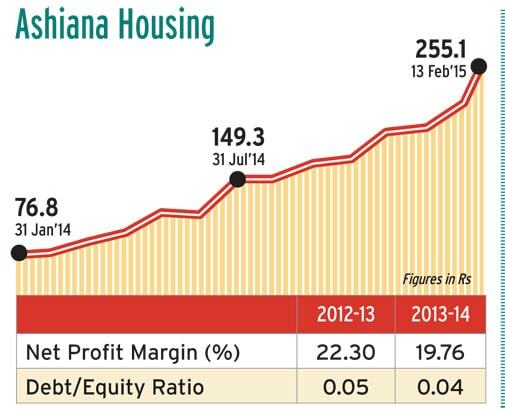 Ashiana, which follows project completion accounting, is one of the few real estate companies with nearly zero debt. 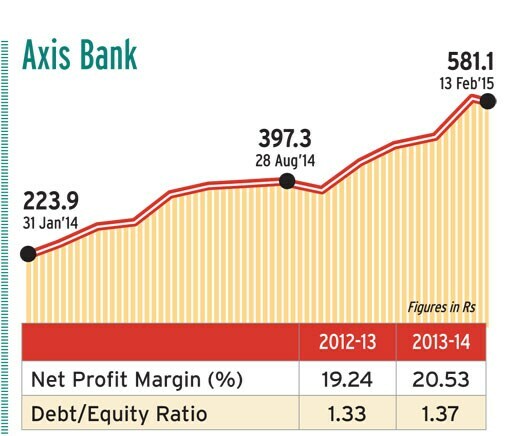 The stock has risen 161% in 2014-15; it was at Rs 244.7 on February 16 as against Rs 93.45 on April 1. The BSE Realty index rose 19.3% during the period. Manglik of Religare Securities says, "Ashiana Housing has been successful in delivering quality projects on time (24-30 months as against the industry average of 36-42 months). It also plans to enter one city each year (starting with Chennai and a few cities in Gujarat) and enhance presence in cities where it is already present. This will drive growth in the next phase." The company is engaged in development of residential as well as large projects such as business cities, industrial parks and special economic zones. It registered a net profit of Rs 41.78 crore in quarter ended December 2014, up 37.89% from Rs 30.30 crore in the corresponding quarter a year ago. The stock has risen 29.13% this financial year and was at Rs 477.55 on February 16. Sandipan Pal, real estate analyst, Motilal Oswal Securities, says, "After a difficult period, Mahindra Lifespace is benefiting from new operating cycle in the residential vertical and improving macro outlook. Likelihood of around five million sq ft launches over the next 12 months means sales momentum will continue. This should improve operating cash flow and return ratios between 2015-16 and 2016-17. We believe the stock can touch Rs 596 in the next few quarters." Lower interest rates will push up demand by encouraging people to take loans for buying products such as air conditioners and refrigerators. The BSE Consumer Durables index has risen 57% since the start of the financial year. It was at 10,430 on February 16. Symphony and Whirlpool of India shares rose 215% to Rs 2,226.35 and Rs 692.60, respectively, during the period. "The consumption sector will get a fillip from fall in interest rates as people are left with more money for discretionary spending. As EMIs (equated monthly instalments) on mortgages, car and other loans fall, makers of white/brown goods and automobiles will get a boost. Consumer finance companies will also gain," says Bodke of Prabhudas Lilladher. The company has 50% share of the domestic air-cooler market. Its strengths are asset-light business model and cash & carry strategy that ensure negative working capital and good returns. It has reduced the impact of seasonality of the business by venturing into different geographies. It exports to more than 60 countries. IIFL says exports have got a big boost from the acquisition of IMPCO, an air-cooler company based in Mexico. Symphony is using IMPCO's tie-ups with large modern retail stores such as Wal-Mart, Home Depot and Lowes to sell its products. It exports around two lakh units a year. The size of the global market is seven million. 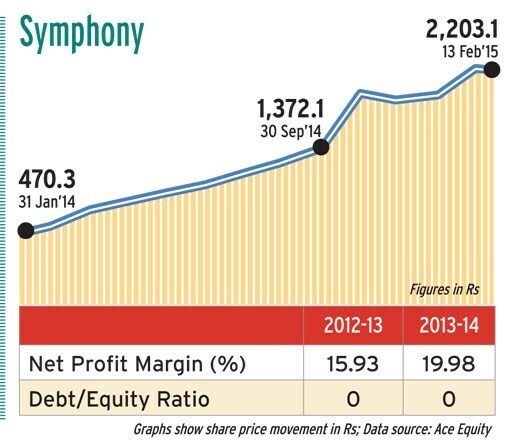 Other things that make Symphony attractive are debt-free balance sheet and good financials and management. The stock has risen over three-fold in a year. It was at Rs 2,226.35 on February 16. As on June 2014, its return on equity, or RoE, was 47% as against 37% and 36.75% at the end of June 2013 and June 2012, respectively. According to an ICICI Securities report, between 2010-11 and 2012-13, it was at an average one-year forward earnings multiple of 15 times with annual revenue and earnings growth of 14% and 8%, respectively, and average RoE of 30%. The company will post annual revenue and earnings growth of 28% and 33%, respectively, between 2013-14 and 2016-17. Considering the continuing strong performance and expectation of strong returns, the stock can touch Rs 2,764 in the next six months. The company is one of India's top makers of room air-conditioners with 20% market share. According to a report by ICICI Securities, it is set to benefit from changing demographic profile and revival in India's investment cycle. The revenue of the unitary cooling products (UCP) division grew 16% a year between 2009-10 and 2013-14, mainly due to the change in focus towards premium products. The stock has risen 57% this financial year till February 16. ICICI Securities is bullish on the company. "With sustained demand from Tier-II and Tier-III cities and rising urbanisation, the UCP division will witness 8% annual volume growth (as against 5% industry growth) between 2013-14 and 2016-17. Voltas' strategy to focus on profitability by bidding for small and high margin projects and timely execution will help it expand margins. The stock can touch Rs 348 in the next 12 months." The net profit of capital goods companies fell over 44% in the five years till March 2014. Sanjeev Zarbade, vice president, private client group, Kotak Securities, says, "The capex cycle has been stalled due to a number of factors, one of them being the series of interest rate increases by the RBI. Thus, a cut in rates could boost the investment cycle, helping capital goods companies." Since 1 January 2014, the BSE Capital Goods index has risen 65% (till February 16). BEML rose 303% to Rs 955 during the period. It was followed by Bharat Electronics (259% to Rs 3,664), Sadbhav Engineering (232% to Rs 316) and VA Tech Wabag (190% to Rs 1,625). Zarbade says, "The rise can be attributed to factors like thrust on indigenisation in defence equipment manufacturing, interest rate cuts that may boost the investment cycle, government initiatives to address the logjam in coal mining and announcement of the civil-nuclear deal that may spur investment in nuclear power." Larsen & Toubro, Pipavav Defence and Offshore Engineering Company and Sadbhav Engineering had consolidated debt-to-equity ratios of 2.25, 2.36 and 4.65, respectively, at the end of March 2014. For Crompton Greaves, Bharat Electronics and Va Tech Wabag, the figures were 0.66, 0 and 0.19, respectively. It the largest engineering & construction company in India with a wide sector and geographical spread that protects it during periods of slowdown. Piyush Jain of Morningstar India says, "L&T has a robust order book with 90% revenue visibility for 2015 and 2016. Heavy government spending on infrastructure should help the company meet its 2015 guidance of 20% growth in new order inflow and 15% in revenue. Rate cuts will reduce interest costs and improve margins." According to a report from Credit Suisse, L&T can touch Rs 1,975 in the next few quarters. On February 16, the stock was trading at Rs 1,650 on the BSE. For year ended March 2014, the company registered a consolidated operating profit of Rs 11,736 crore, up 7% from Rs 10,984 crore a year ago. It had a total debt of Rs 59,888 crore on March 2014. *This story appeared in Money Today March 2015 issue, which hit the stands before the interest rate cut by RBI on March 4, 2015.